Under attack over a string of failures, India's chief hockey coach Gerhard Rach has quit his job. The German-born Rach, whose future was hanging in balance following a string of poor performances by the team in various events including Olympics and Champions Trophy, has taken up a new assignment with the national team of Egypt, the Indian Hockey Federation said today. A new chapter in Indian sports unfolds tomorrow as the much-awaited inaugural edition of the Premier Hockey League kicks off at the floodlit Gachibowli Stadium here. The Delhi High Court today issued a notice to the Board of Control for Cricket in India to file a report within two weeks, stating its stand on improving cricket in the country in the next five years. Talented Hyderabad batsman Ambati Rayudu was today named captain of the India u-19 squad to play in the first two Tests against the visiting English side later this month. Prime Minister Manmohan Singh kicks off the 9th National Football League (NFL) at Kolkata's Salt Lake stadium on Wednesday. Abdul Razzaq hammered an unbeaten 89 from 61 balls and Rana Naved-ul-Hasan produced a last-gasp three-wicket burst as Pakistan edged home by 13 runs in a limited-overs match against Australia A today. Roger Federer closed with an ace and then a rifling forehand today, starting his fine-tuning for an Australian Open title defence with a 5-7, 6-1, 6-4 win over Gaston Gaudio at the Kooyong Classic exhibition tournament. Andre Agassi unveiled a sleeker physique in his 6-1, 7-6 (7/4) win over Olympic gold medallist Nicolas Massu and would next face second-ranked Andy Roddick, who breezed to a 6-1, 6-4 win over Croatia’s Ivan Ljubicic, a late replacement for the injured Paradorn Srichaphan. Seeded players, including third seed Prakash Amritraj, fifth seed harsh Mankad and sixth seed Sunil Kumar Sipaeya sailed into the men’s singles quarter-finals of the $ 15,000 prize money MSLTA-ITF Futures Tennis Circuit at the Ranade Centre here today. Mohun Bagan put up a spirited display to hold defending champions East Bengal to a goalless draw in the inaugural match of the ninth National Football League here today. Wresting the initiative from their dreaded arch-rivals, Bagan played their hearts out to share honours in the Salt Lake Stadium exchange. Under attack over a string of failures, India's chief hockey coach Gerhard Rach has quit his job. The German-born Rach, whose future was hanging in balance following a string of poor performances by the team in various events including Olympics and Champions Trophy, has taken up a new assignment with the national team of Egypt, the Indian Hockey Federation said today. IHF Secretary K Jothikumaran said Rach had telephoned IHF president KPS Gill last night to inform him about his decision. "Rach called up Gill last night to tell him about his decision. The IHF wished him all the best in his future endeavour," Jothikumaran told PTI. 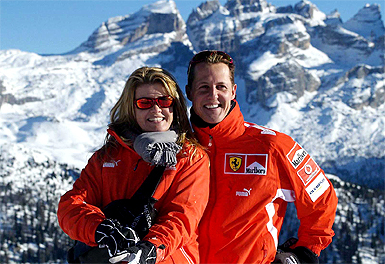 Rach became the first foreign coach of the hockey team when he was appointed to the top job just a few days before the Olympics. He would officially take over as the coach of Egypt on January 25. On the appointment of new coach, Jothikumaran said "We have enough time to think on this aspect. Mr. Gill and other office-bearers of the IHF will take a decision on this at the appropriate time. "At the moment we are now fully focussed on National Junior Development Programme which will be held simultaneously with the Premier Hockey League." Asked whether the IHF would opt only for a foreign coach, the IHF Secretary did not give a direct reply but said "as our chief has informed already, the IHF will cross the bridge when we come to it". Mr Gill had said in an interview to PTI recently that a decision would be taken on Rach at the end of this month. Earlier, IHF secretary K Jothikumaran told UNI from Hyderabad that the Federation was in the dark about Rach's decision to join the Egyptian team. ''We are not aware of it, neither Rach informed us about this move. I'm hearing it only from the media,'' he said. Commenting on the development, Mr Jothikumaran dropped hints that the federation was not unhappy with Rach's decision. ''If he has taken up other assignments, I think it is good for him,'' he remarked. Rach was allowed a holiday after India's poor show at the Champions Trophy in Pakistan and since then his fate was uncertain. Rach had replaced Rajinder Singh just before the Athens Olympics and the German became the first foreign coach of the national team. But under him, the team finished a poor seventh at Athens and fourth at Champions Trophy. Rach faced criticism from within the team for shunning the Asian style of hockey and opting for defensive strategy and a number of senior players questioned his authority during the Olympic Games. A new chapter in Indian sports unfolds tomorrow as the much-awaited inaugural edition of the Premier Hockey League (PHL) kicks off at the floodlit Gachibowli Stadium here. Among the many firsts that the event will bring to Indian hockey, the most important will be the touch of professionalism, with 13 foreign players showcasing their skills in the Rs 71 lakh prize money extravaganza. The two-tier league, to be played over a month-long period, has been devised in US baseball league style, tailor-made for television and featuring teams with macho names. The matches will be played in double-leg round-robin format, with five teams featuring star players in the premier division vying for the winner’s purse of Rs 30 lakh and as many in the first division, the winner of which will bag Rs 4 lakh. The sudden exit of Gerard Rach as the national coach, combined with the recent caustic remarks of Indian Hockey Federation chief K.P.S. Gill on current and former players, may have marred the festive air to some extent, but the players are nevertheless enthusiastic about the event. The spotlight will be on Pakistan’s short corner specialist Sohail Abbas, who will appear for Hyderabad Sultans, led by Indian skipper Dilip Tirkey, in the premier division. The hosts take on Sher-e-Jalandhar, captained by star Indian forward Gagan Ajit Singh, in the inaugural tie. Bangalore Hi-Fliers, headed by Arjun Halappa, Maratha Warriors (Viren Rasquinha) and Chennai Veerans (Ignace Tirkey) are the other three teams in the fray. Gagan has said his team will start as the favourites as they have a strong defence and attack. Maratha Warriors too have a strong defence and equally aggressive forwards in Dhanraj Pillay and Viren Rasquinha, with talented Indian custodian Adrian D’Souza guarding the post. Chennai Veerans have a good mix of experience and youth, with Ignace Tirkey at the helm. 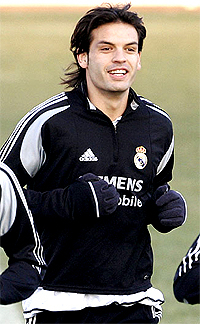 Bimal Lakra, Spanish star Juan Paablo Escarre and goalkeeper Devesh Chauhan make the team more formidable. Dilip Tirkey’s Hyderabad Sultans, despite having the services of Sohail Abbas and Wasim Ahmed (both Pakistan), look a moderate team while Bangalore Hi-Fliers have a balanced side, with Prabodh Tirkey, Mudassar Ali Khan, Len Aiyappa and Pawal Lakra in their ranks. The first division, which kicks off on Friday, comprises Lucknow Nawaabs led by Rajneesh Mishra, Chandigarh Dynamos (Sukhbir Singh Gill), Imphal Rangers (Brojen Singh), Delhi Dazzlers (Anurag Raghuvanshi) and Bengal Tigers (Iqbal Singh). The matches feature four quarters of 17 and-a-half minutes each. But more radical will be the reduction of players on each side as a tie heads for the tie-breaker. While 11 players will be on the field during the 70-minute regulation time, a side will be reduced to nine in the first extended time of 15 minutes. The number will go down to seven in the next 10 minutes. The Delhi High Court today issued a notice to the Board of Control for Cricket in India (BCCI) to file a report within two weeks, stating its stand on improving cricket in the country in the next five years. A Division Bench comprising Chief Justice B.C. Patel and Mr Justice S.K. Kaul asked the BCCI to file the vision report in the court. Hearing the public interest litigation (PIL) petition filed earlier, the Judges asked whether the body was initiating any steps for the improvement of the game in the country. A PIL was filed earlier, seeking clarification whether the BCCI was a public body or a private body. The court had earlier stated that the board was performing public duties and open to judicial scrutiny under the extraordinary writ jurisdiction of Article 226 of the Constitution. Talented Hyderabad batsman Ambati Rayudu was today named captain of the India under-19 squad to play in the first two Tests against the visiting English side later this month. Former India paceman Venkatesh Prasad would coach the 14-strong team of which Bengal batsman Manoj Tiwari would be the vice-captain while Baroda's Pinal Shah would keep wickets. The series commences with the first four-day Test at Bangalore on January 22. The unlikely win, sealed with eight balls to spare, came after the touring side were whitewashed 3-0 by Australia in their test series. They face the world champions and West Indies in a triangular one-day series starting later this week. Pakistan fought back twice to steal the win. They had slumped to 117 for five in the 30th over when Razzaq arrived to hoist his side to 279 for eight at Adelaide Oval. He then took two for 45 in Australia A’s 266 all out but it was Naved-ul-Hasan who proved the key as he took three for 42. Reverse-swinging the old ball he ripped through the tail as Australia A lost their last six wickets for 12 runs. Australia A captain Brad Haddin was the ninth wicket to fall, run out for 129 from 123 balls with 11 fours and one six. Razzaq hit six sixes, three off them from six deliveries from spinner Nathan Hauritz, and four fours. Mohammed Hafeez made 61, putting on 68 for the sixth wicket with Razzaq. The Australians still looked in control with all rounder Cameron White coming to the crease at 254 for five in the 45th over. He was unluckily run out for a duck at the bowler’s end, however, a Haddin drive rebounding off bowler Shahid Afridi’s outstretched hand onto the stumps. Naved-ul-Hasan then bowled tailenders Damien Wright and Hauritz with inswinging yorkers and had Shaun Tait caught behind for a first-ball duck to end the innings, one ball after Haddin’s run out in the 49th over. Australia host West Indies in Melbourne on Friday and the home side will then play Pakistan in Hobart two days later. Roger Federer of Switzerland laughs during his match against Gaston Gaudio of Argentina at the Kooyong Classic tennis tournament in Melbourne on Wednesday. Roger Federer closed with an ace and then a rifling forehand today, starting his fine-tuning for an Australian Open title defence with a 5-7, 6-1, 6-4 win over Gaston Gaudio at the Kooyong Classic exhibition tournament. Andre Agassi unveiled a sleeker physique in his 6-1, 7-6 (7/4) win over Olympic gold medallist Nicolas Massu and would next face second-ranked Andy Roddick, who breezed to a 6-1, 6-4 win over Croatia’s Ivan Ljubicic, a late replacement for the injured Paradorn Srichaphan. Agassi and Roddick would meet tomorrow in the eight-man promotion-relegation format, while Federer would play on Friday against Tim Henman, who had a 6-1, 7-5 win over Argentina’s David Nalbandian. Top-ranked Federer, who won 11 titles in 2004 — including three majors — and started this season with another title at Qatar last week-end, lost a service game for the first time this year, in the first set against French Open champion Gaudio. He upped the tempo in the second, breaking Gaudio’s serve twice, and then went a break up in the seventh game of the deciding third set. 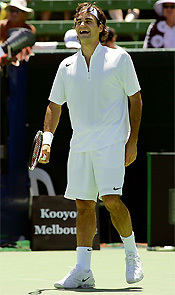 Coming into Kooyong, Federer had won 21 consecutive matches in ATP tour events. He said having an exhibition tournament as a tune-up for a major gave him the perfect chance to tinker with some of his shots without risking his tour record. “It gives you an option to try out some things, that is very clear,” he said. “It is good to start the Australian trip with a win, at least I have got a bit of rhythm now,” he said. Federer lacked his usual precision on his serve in the first set and sprayed most of his 49 unforced errors early as he adjusted to the faster pace of the Australian courts. He found his service range and got his powerful forehand working in the second set, having 11 of his 24 winners on that side. Agassi (34) knows that he needs something extra to counter Federer’s arsenal of shots this season. So in the off-season, he trimmed down to about 74 kg from about 80 kg after concentrating on strength and fitness instead of tennis technique. 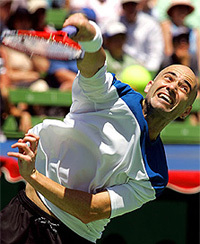 Agassi has won the Kooyong Classic thrice, in 2000, 2001 and 2003, and each time he has gone on to win the subsequent Australian Open. He will need to get past fellow American Roddick first. Roddick said he was using the USA’s loss in the Davis Cup final to Spain last month as motivation for this season. He started with a 61-minute win over Ljubicic, who lost to Federer in the Qatar final last week-end. The outcome was not as important as the match practice for Roddick, but he said he would get a psychological boost ahead of a major if he beat Agassi in the next match. “Whenever Andre and I practise — even if a tournament is a month away — we are still intense,” said Roddick, guaranteeing that their head-to-head would be more than an exhibition. The losers of today’s matches go into a bracket to play off for fifth to eighth places. Ljubicic was drafted into the eight-man draw to replace Paradorn, who withdrew because of an injured right wrist. The problem was not expected to keep him out of next week’s Australian Open. AUCKLAND: They came, they played, they were conquered. Three members of the victorious Spanish Davis Cup team which defeated the USA last month have been knocked out in the first round of the New Zealand Open. Rounding out a miserable Tuesday for Spain, the fourth member of their Davis Cup team, Carlos Moya, lost to Radek Stepanek of the Czech Republic 2-6, 6-4, 6-2 in the first round of the Medibank International in Sydney. In New Zealand, second seed Tommy Robredo and former world number 1 and tournament seventh seed Juan Carlos Ferrero were defeated in three sets by qualifiers, while rising teenage star Rafael Nadal withdrew through illness. In the tournament, serving as a final honing of skills before the first grand slam of the year — the Australian Open — Robredo was all class at 6-4, 4-1 in the late-night game against Raemon Sluiter of the Netherlands. But then his game fell apart. Sluiter came back to take the second set 6-4 and then continued to serve rockets in the third, where he broke the world number 13 at 4-4 and then served out the match for a 4-6, 6-4, 6-4 win. For an established top 20 player like Robredo, it was a frustrating way to lose. In his match against Jan Hernych of the Czech Republic, Ferrero took the first set 7-6 and went downhill from there, with Hernych taking the next two sets 6-1, 6-3. Fast serving Indian Davis Cupper Amritraj, son of Indian tennis legend Vijay, rallied magnificently after dropping the first set to pip qualifier Vinod Sridhar of India 4-6 6-2 6-1 in one hour 30 minutes while his Indian teammate Mankad crushed wild card Stephen Amritraj of the USA 6-2 6-4 in one hour 14 minutes. Sipaeya needed a first set tie-break to sideline unseeded American Lester Cook 7-6 (8-6) 6-4 in one hour 30 minutes to move into the last eight stage. Also moving up were top seed David Sherwood of Britain, second seed Simon Greul of Germany, giant-killer Vishal Uppal of India, unseeded Englishman Michael Ouvarov and Karan Rastogi. Mohun Bagan put up a spirited display to hold defending champions East Bengal to a goalless draw in the inaugural match of the ninth National Football League here today. Wresting the initiative from their dreaded arch-rivals, Bagan played their hearts out to share honours in the Salt Lake Stadium exchange. The green-and-maroon brigade, however, failed to cash in on their numerical advantage after East Bengal were reduced to 10 men following the expulsion of Chandan Das, who picked up his second yellow card for bringing down rival midfielder Noel Wilson in the 65th minute. 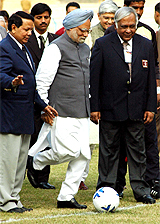 The derby, inaugurated by Prime Minister Manmohan Singh amidst much fanfare, began at a fast pace, but was later reduced to a midfield mix-up as none gave any space to the other to create positive chances. Nine yellow cards were flashed by referee K. Shankar during the course of the match, with Das picking up a red after double booking. East Bengal missed the easiest chance of the day through Syed Rahim Nabi in the 78th minute, when a Habibur Rahman throw from the right flank came past Mohun Bagan rearguards to the unguarded youngster, whose attempt from close inched out over the bar, much to the relief of rival custodian Prosanto Dora.